Ok, let's talk about how I got this thing done. (1) Use wire brush to remove as much rust as possible. (2) Use power sander with 150 grit paper to thoroughly sand all the damaged areas. 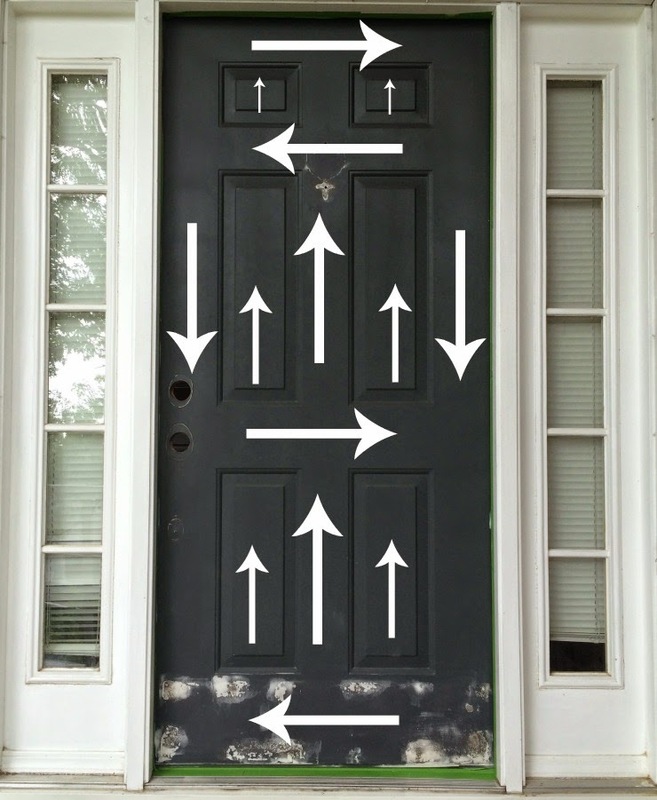 (3) Carefully fill defects in door with filler. (4) Let filler dry overnight. (5) Sand filler again until it is smooth and level with the rest of the door. (6) Thoroughly clean surface of door and let it dry completely. Of course, painting itself required a bit of prep work. First and foremost, I used painter's tape to tape off the frame of the door to prevent getting blue where I didn't want it. Then, I had to remove the existing hardware and let's be honest -- that brass piece of crap ended up in the trash can FAST! I replaced it with this nice set I found on Amazon for only $70. 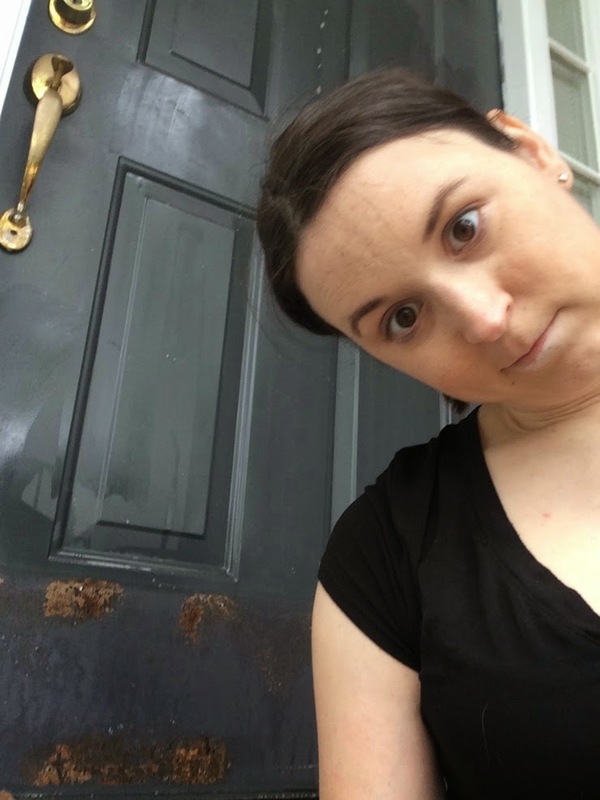 Since we decided to go with a bronze finish and I wanted to keep the door knocker (it has character) I decided to simply spray paint it to match the new hardware. The arrows denote where I used a foam roller and the direction in which I used it. If it doesn't have an arrow on it, then I painted it using the angled brush. Also, this picture gives you a good idea of what to expect your patch job to look like after you've finished. It isn't pretty is it? In fact, after the first coat of paint I was actually a little worried because you could totally STILL see where I had patched up the damage left behind by the kick plate. 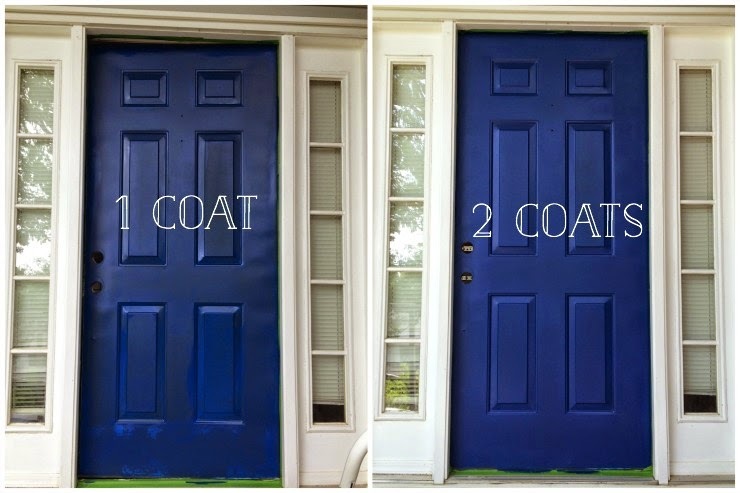 See how the damage still shows up after one coat? Much to my delight however, a second coat took care of that and you can't see the patch work at all. Woo! In case you were wondering, I let the paint dry about 30 minutes in between coats. And of course, there is still a lot of work to do on our front porch to make it the dream I've been pinning about for quite awhile. But for now, instead of focusing on doormats, welcome signs, and flourishing plants, I'm just going to spend some time hanging out and appreciating how far we've come on #FlorkenFirstHome in only a year. I sure do love this home and I love its welcoming entrance even more now. LOVE IT! 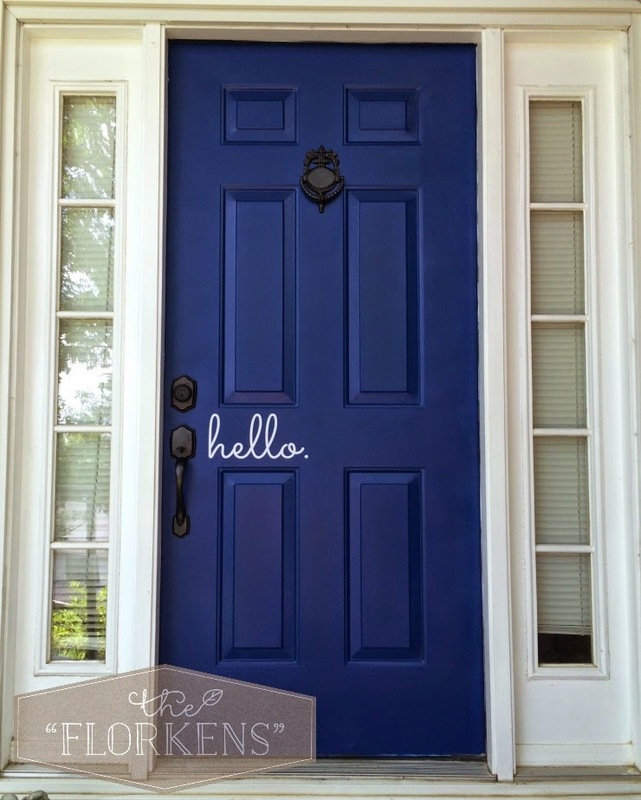 I have been dying to give our front door a makeover and you have just inspired me! I love that blue. The house next to our apartment has a blue door and I AM IN LOVE!! I love seeing all the stuff you are doing. The door handle is awesome too. It looks lovely, and truly welcoming! I love the blue! I love it!! 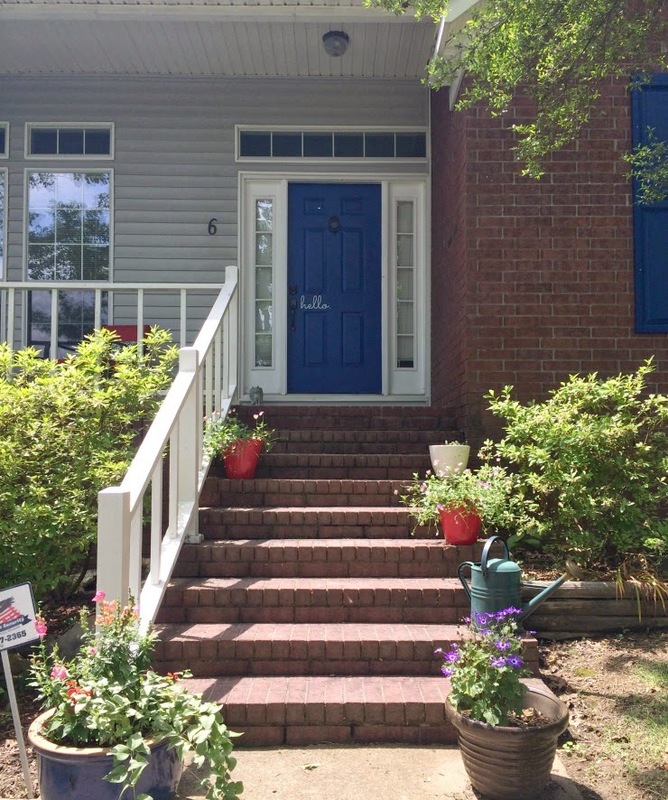 I'm hoping to paint mine and add some character to our porch later this summer. The blue is so welcoming and happy. 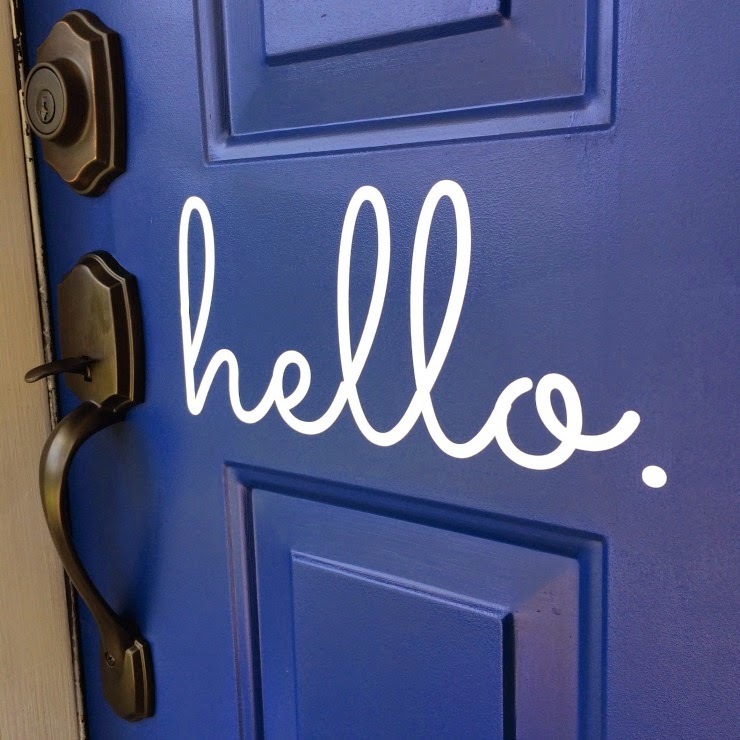 I love the "hello" decal, etsy is great for creative touches! It looks great Kate!! That along with the shutters :) The colour blue you chose is just perfect! Oh my goodness, it looks AMAZING! I completely thought the hello was a graphic you put on the image, but NO! It is adorable! Go you! I really love that color! So pretty! Great job! I'm loving that door! The "hello" is the perfect touch! That is quite the difference going from black to purple. The purple makes the grooves and designs carved into the door, stand out a whole lot more. In addition, the knocker knob at the top of the door bears a greater visual prominence. What Exactly Did You Use, To Remove The Kick Plate? I'm Not a Fan Of Brass and Would Like to Remove Mine! 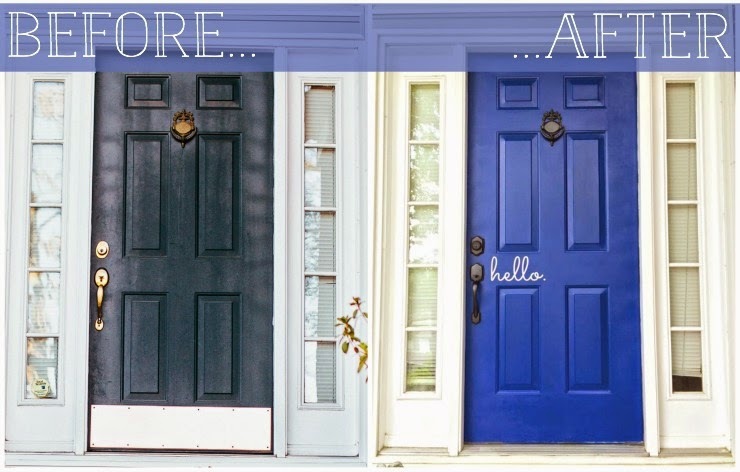 My Project For The Weekend, Is To Paint and Re-Do Our Front Door and Shutters! I'm So Excited!Thank You for Your Advise In Advance! Hi Brenda! 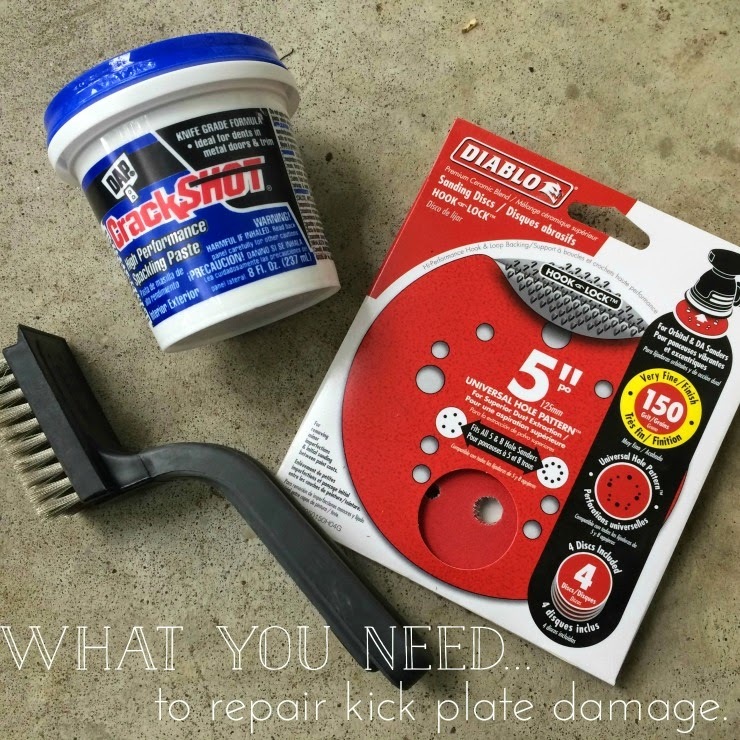 I simply used a screwdriver to remove the kickplate and them used the products pictured above to patch the holes/rust left behind by the kickplate. And then that ugly brass kickplate went STRAIGHT into the trash! ha! Did I miss what brand and name of color blue you used? It's Blueberry Twist by Behr in a Satin finish. What color is this blue? Who makes it? Do you know the name or the number?